Catherine Tinsall is dreading Christmas. As the 'Happy Homemaker' she is an online sensation, but the reality couldn't be more different. With Catherine's marriage in tatters, her children running wild and her mother increasingly forgetful, seasonal cheer is running low. Husband Noel also hides a secret: he's facing the axe at work. Until he chances upon the village of Hope Christmas, deep in the Shropshire countryside, which could be the second chance he's searching for. If he can save it from the developers! In Hope Christmas itself, schoolteacher Marianne Moore is trying to heal her battered heart. But Christmas is a time for families, and memories of what she's lost haunt her at every turn. Meanwhile, Gabriel North faces a lonely Christmas but hides his sadness for the sake of his son. Will his wife ever come home? Or does love lie elsewhere? All four need a Christmas miracle. And it might just happen - courtesy of a mysterious guardian angel ! Forced to reassess their lives, will Catherine, Noel, Marianne and Gabriel discover what the meaning of Christmas really is? An irresistible gift of a tale that will warm the hearts of Christmas-lovers and Scrooges alike! I must admit it took me a while to get into this book, but by the end I’d found it both heart-breaking and heart-warming. This book is seamlessly put together; rather than each chapter focusing on different characters, Williams does this within the chapter. Williams moves around the village of Hope Christmas, Shropshire and dips into London without breaking the flow or losing pace, or most importantly, the reader. I have a habit of not reading the back of books before I start anymore; I love that it gives you a greater journey of discovery for some books. This was one of those, I slowly got to discover the secret of Ralph Nicholas which I thought was very cleverly woven in (and would have been far more obvious if I’d read the synopsis). I loved that the book was split into four parts, which were based around Wham’s Last Christmas!! Each part begins with a chapter containing flashbacks to Last Year with the rest of that parts chapters focusing on This Year. This provided a slow release of each characters back story which I thought worked really well! 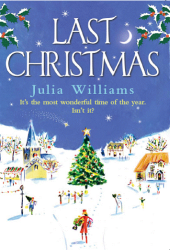 Thank you to Julia Williams for the copy of Last Christmas. 3 signed copies of Last Christmas away to readers of my blog. All you have to do to enter is follow this blog on GFC and leave me a comment answering the following question: "Are you hoping this Christmas will be just as good or better than your last Christmas?" Please remember to leave an email address or twitter id so I can contact you if you win. Winners will be contacted by me to arrange delivery of your prize. Winners must provide a UK address for delivery of prize - UK ONLY. I reserve the right to redraw winners if winners no response within 3 days. I'm hoping Christmas will be just as full of sparkle as it was last year. Our family has expanded with my 18yo's girlfriend (who is lovely) so we're hoping to all spend some time together over break :) Just love Crimbo! I would love it to be more exciting than last year ... even buying new board games to get the oldies off the sofa!!! I am hoping this christmas will be as good as last christmas. It was great to have all the family together. Thank you for a lovely giveaway! I hope it will be better than last year. My Dad died last year and we had just moved house and everything was a bit awful. I still enjoyed Christmas but I think this year will be easier and happier. Merry Christmas to you and thanks for the chance to win. I am hoping Christmas will be as good as last year. Looking forward to my boys being home from Uni and not having to travel anywhere on Boxing Day due to football!! Hoping that it's better than last year when I was so strict on my diet I didn't even have a roastie AND had the in-laws! This year just HB, the dog and me with a huge bowl of spuds - LUSH ! I hope mine will be very much like last year. A lovely one spent with my grandparents! Love a good Christmas book! I am hoping this year will be better than last year! My dad got VERY drunk last christmas morning at my Grandad's and fell flat on his face on the ice on the way to the car to come home for Christmas lunch!!! Luckily he was so drunk he didn't hurt himself but being that drunk meant he was swaying while he was trying to eat!!! Haha!! I'm sure this Christmas will be even better than last as we have recently had a new addition to the family and he will be experiencing his first ever Christmas! So I'll be taking plenty of photos of him as they grow up so quick! i'm sure this christmas will be as good as the last one, I wont be seeing all my grown up children on that day but I will be on Boxing day, the celebrations will just continue over to the next day. I'm hoping that it will be better this year! Last year was spent in hospital with my mum so fingers crossed for this year!